Launched in 2017 with exterior/interior styling by Winch design, the 279-foot-long Areti was designed with 9 en suite staterooms, meant to lodge 18 guests along with the staff members. The owner’s stateroom is luxurious with wardrobes and his and hers baths. The “queen of the show” has an array of features including a sports room for water and land toys, a helipad, and a spa and beach club. The 244-foot custom super yacht Elandesswas built by Abeking & Rasmussen in Germany and has just been delivered to the owner. With spacious exteriors and interiors designed by Harrison Eidsgaard, guests access plenty of space across six cabins, with a master suite placed forward on the main deck. The large sun deck outside houses the swimming pool, an exclusive “Nemo lounge” with a huge glass window below the waterline and an observation lounge for the upper deck. 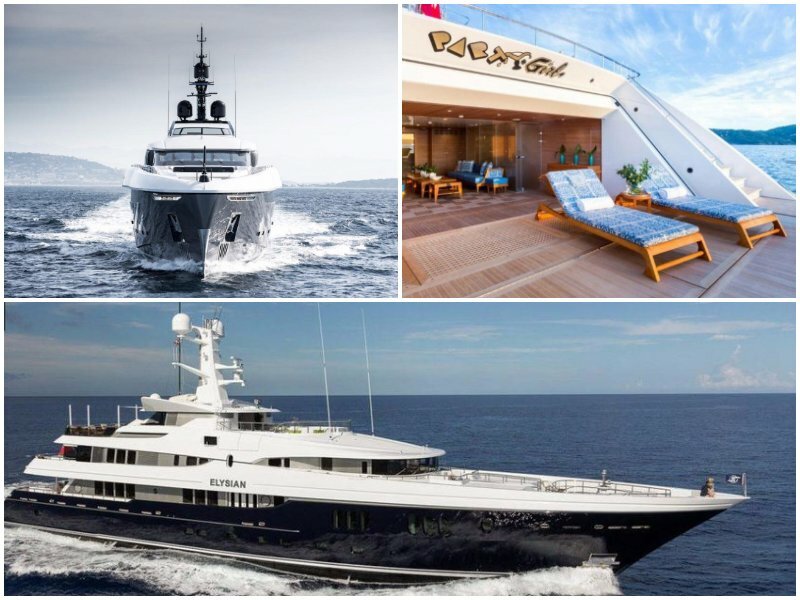 Built in 2010 by the luxury firm Codecasa, the Eternityjust went through an extensive interior refit. This 206-foot-long yacht accommodates 14 guests in 7 cabins with interiors designed by Della Role and exteriors by Codecasa. Utopia IVis a brand new 205-foot superyacht that was built by Rossinavi to accommodate 12 guests in staterooms and include a forward-facing master three double cabins, a VIP cabin, a twin cabin and a private balcony. The crew quarters are large enough to handle a staff of 13. 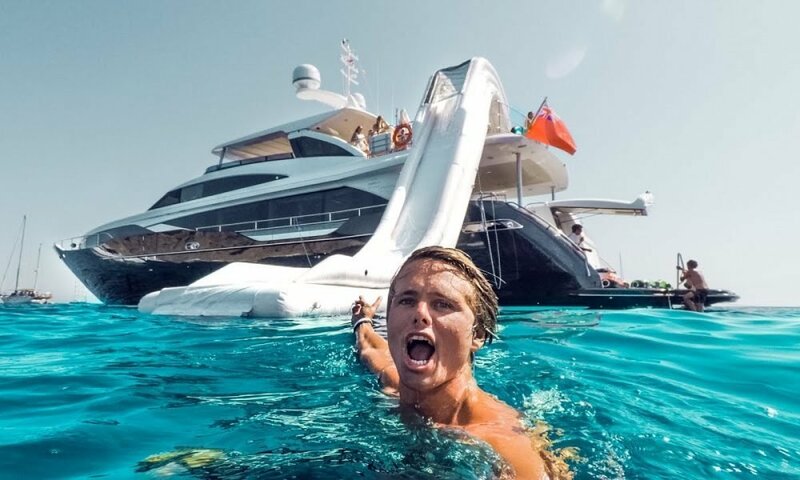 Utopia IV also has a large beach club in the transom, a touch-and-go helipad, three spa pools, and its own Instagram account. 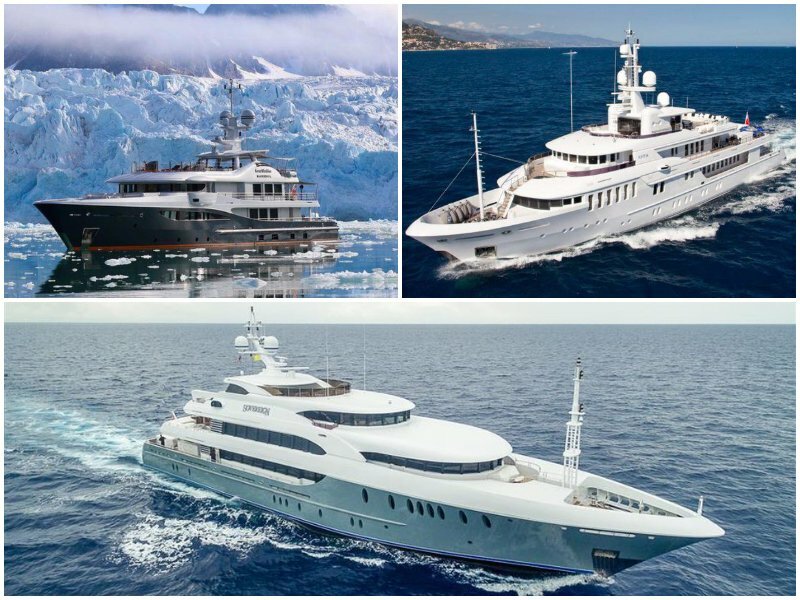 Abeking & Rasmussen made this 197-foot yacht with elegant exteriors designed by Donald Starkey Designs and contemporary interiors by Bannenberg & Rowell. The adaptable accommodation has a master suite on the main deck and four guest cabins on the lower deck. Special features include a beach club swim platform, hot tub, and various water toys and exercise equipment. Gene Machineis a much-loved Amels Limited Edition 180 launched in 2013, and designed by Tim Heywood. This yacht spent many seasons in the Caribbean and the Mediterranean, and used for polar explorations above the Arctic Circle. When Gene Machineis not ice-bound, its 1,668-square-foot deck has outdoor access through a fold-out balcony from the owner’s suite. Two balconies off the main-deck salon ensure amazing sun bathing for guests. Kinta, preciously called Vinydrea was built in 2008, and underwent a major refit in 2010-2011 and well maintained since then. 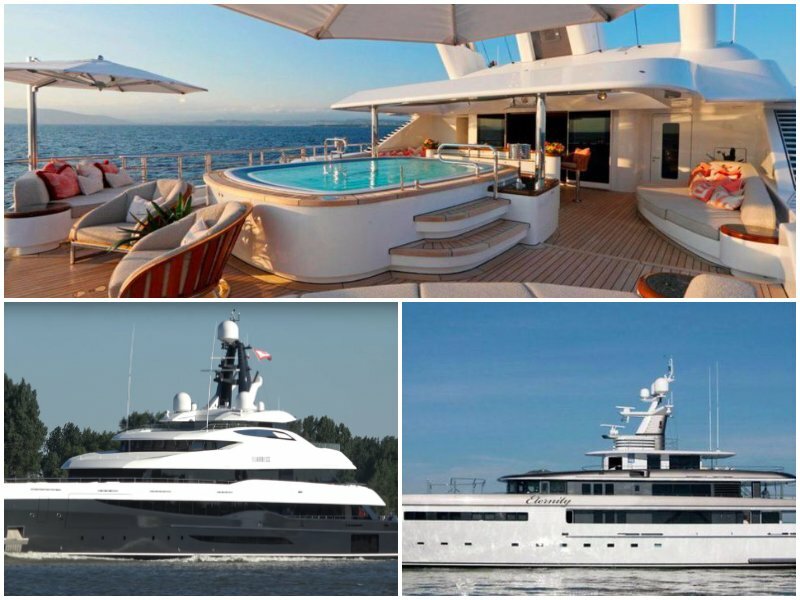 Comfortably housing 12 guests in 6 staterooms, this yacht’s special features include a swimming pool, hot tub, full gym and spa cabin and veranda style dining on the bridge deck, with a full-beam master suite having floor to ceiling windows. This 180 foot vessel has two master staterooms, one on the upper deck with 270 degree panoramic views and the other a full beam stateroom along the main deck highlighting outstanding ocean views through it’s 8 windows. Below deck are four guest staterooms, including a VIP stateroom with his and her baths, a large guest stateroom and two twin staterooms, each with a twin and Pullman berth. 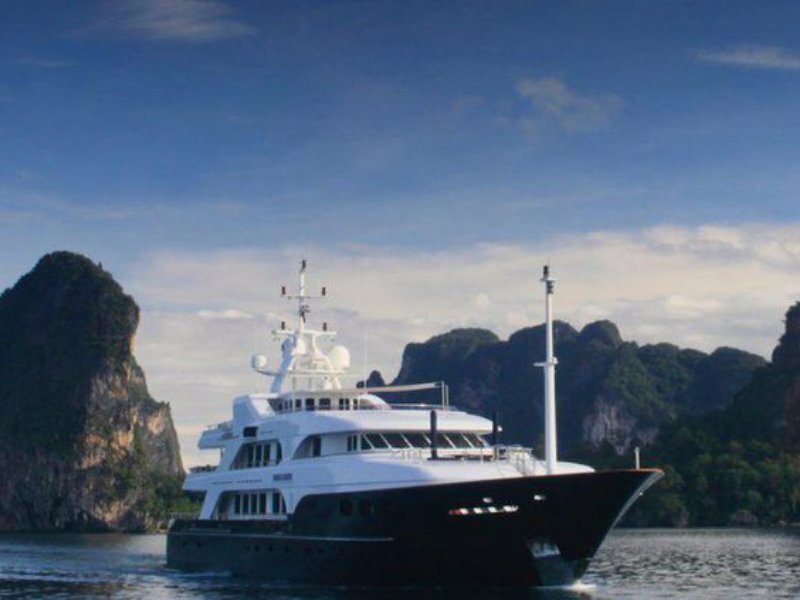 Noble House has a long record as a popular charter yacht and after a recent $5 million refit, she is in top condition. Charter guests love the Zuretti styled on-board spaces including the master cabin on the main deck. The lower deck is home to four double staterooms and one twin, with their own ensuite bathrooms.